Slings are where it’s at Ladies and Gents: whether you’re a full-on attachment aficionado, or simply want to make your post-baby life easier. Â Sometimes, though, the choice of carriers can be overwhelming. Two things to bear in mind are: does the sling distribute weight over your hips and shoulders? It’s crucial to protect your back. Secondly, and equally as important: does it support your baby’s natural hip position? This should resemble a frog, which means that the base of the carrier needs to go from spine to knees, not merely supporting your baby under her bottom. Here’s a quick carrier-rundown which should simplify things. There are three main types of carriers to choose from, with different variations that riff on these basic designs. These are lovely for newborns who may feel more comfortable lying almost flat; they are great for breastfeeding on-the-go too. 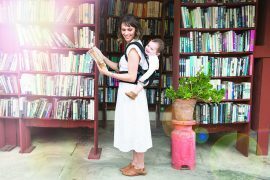 The single strap design, though, lacks hip support for whoever’s carrying which means that baby slings are not suitable to hold an infant for extended amounts of time. But they are great for dashing into shops, or settling your little one to sleep. 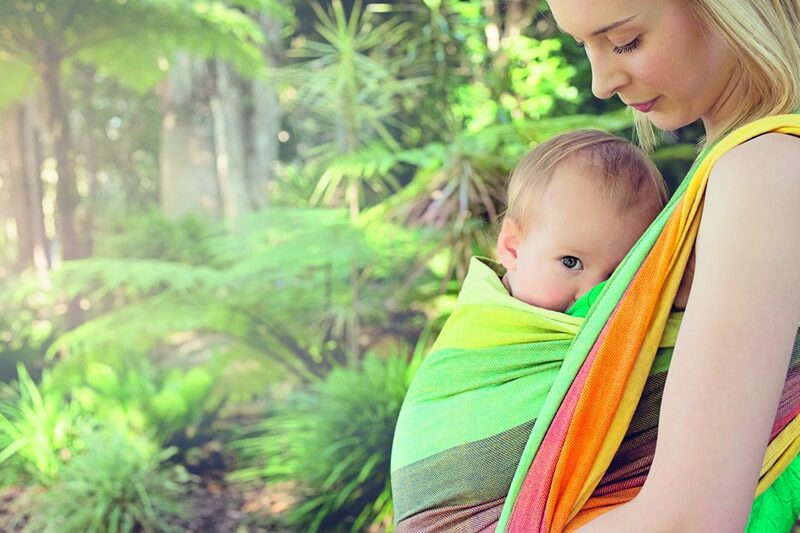 Nature’s Sway do a lovely Baby Sling in Organic Cotton. The ‘one click and you’re in’ system makes the design ideal for quick trips where your baby will be in and out of the carrier. Â The wide, contoured shoulders also add extra support. This design is also wonderful for newborns. At its most basic, the stretchy wrap is a long piece of jersey fabric that a user can tie many different ways, so great for flexibility. 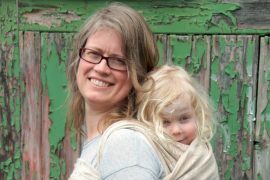 On the flipside, it is more fiddly to wear than the baby sling so not so useful for quick trips, although once you’ve mastered the wrapping method it provides excellent hip and shoulder support for wearing over a long period, plus it fully supports your baby’s natural ‘froggy’ position. The upright position is also great for colicy babies. Â If you struggle with the wrapping, Nature’s Sway have instructions here: http://www.naturessway.co.nz/site/naturessway/1948NSWrapInstructions.pdf Â or search You Tube for “Front Facing-In Wrap’. Soft Structured CarriersÂ (SSC) demand the biggest investment, but some would argue that they are worth every penny. Like a baby sling, you can simply clip-on and go; but like the wrap your baby’s weight is well-distributed across your shoulders and hips so easier to carry for longer periods. Â With an infant insert in place, a soft structured carrier will take you from a tiny newborn snuggled on your front, right up to a busy preschooler waving at passers-by on your back. Belly Beyond stock Ergobaby carriers, a brand beloved by the babywearing community for its quality and flexibility. Elsewhere have a look at LÃLLÃ‰baby COMPLETE’s Baby Carrier stocked by BabyFirst and Nature’s Sway’s Pouch Pack. 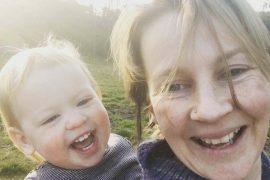 Nice to see another babywearing article – baby carriers definitely make life easier. Just wanted to clarify a few things though. Regarding point 1) slings/hammocks – it is recommended newborns are also carried upright to as it is easier to ensure correct chin-off-chest positioning to avoid positional asphyxia. The cradle carry can be done but is difficult to do correctly (check out Babywearing International for safety info). 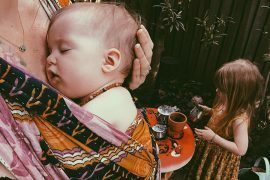 Re point 2) stretchy wraps can be pre-tied and baby popped in and out a few times – they’re very comfy and actually very convenient for quick trips if you remember to tie before leaving the house. Point 3) soft carriers -the ones with buckles – usually called soft structured carriers or SSCs. 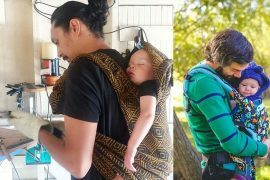 Other categories of carriers that are also awesome are mei tais and woven wraps – these would be well worth a mention too.